The Septum is the narrow ridge of bone and tissue between your two nostrils. The Turbinates are finger shaped tissues that direct and warm air as it enters your nasal cavity. The Lateral Wall is the side tissue that forms the outer wall of the nose. These three structures form a triangular area just inside your nose called the Nasal Valve. Enlargement of any part of the nasal valve reduces the size of the airway as well as the amount of airflow, resulting in nasal airway obstruction. ACCLARENT AERA® has been proven to relieve ear pain symptoms in patients with ETD. The use of ACCLARENT AERA®was tested in patients who failed to get relief with daily intranasal steroid spray (for at least 4 weeks) or an oral steroid (at least 1 completed course). Nasal airway obstruction has traditionally been treated in two ways. Although widely advertised and frequently used, home remedies are never permanent solutions. The most common remedies are nightly breathing strips, nasal dilators, and nasal sprays. Most people with nasal obstruction have tried at least one of these without lasting success. Until recently, traditional nasal surgery has been the only course of treatment for advanced nasal problems. These surgical procedures may be effective in many cases, but they all involve an invasive process, pain, lengthy recovery time, and less-than-spectacular results. Also, traditional nasal surgery does not always address the problems of nasal blockage caused by narrowed nasal valves. The VIVAER® procedure is non-invasive and can be performed in our office. VIVAER® uses a proprietary energy treatment to gently and permanently reshape your nasal airway and improve airflow without any incisions. You’ll begin to experience a noticeable improvement in nasal breathing immediately after your treatment. Non-Invasive, no cutting - VIVAER® technology effectively treats your nasal obstruction by gently and permanently reshaping your nasal tissues without invasive surgery or implants. In-Office - VIVAER® is a simple in-office treatment completed using only local anesthetic. You can return to normal activity right away. Clinically Proven - Clinical studies with VIVAER® have shown significant improvements in nasal obstruction symptoms, with results similar to more invasive surgical treatments. Try two simple tests to see if you could benefit from Nasal Airway Remodeling. Place one or two finger tips on your cheeks on either side of your nose. Gently, press and pull outward. This temporarily opens the nasal valve. If doing this helps you inhale more easily through your nose, your nasal obstruction may be in your nasal valve, and you may be a candidate for VIVAER® Nasal Airway Remodeling. Rate the severity of your nasal blockage symptoms. 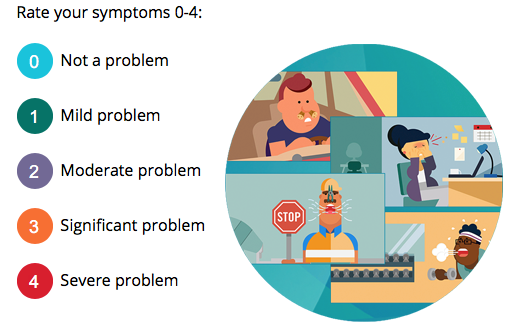 Evaluate these five indicators for nasal obstruction and rate the severity of your symptoms according to the list below. If your score is 50 or higher, you may be a candidate for VIVAER® Nasal Airway Remodeling. Nasal congestion or stuffiness - a less severely blocked up feeling that might accompany a cold or allergy. Nasal blockage or obstruction – a more constant blockage that doesn’t seem to be related to a cold, infection, or seasonal allergy. Trouble breathing through your nose – more severe and persistent breathing difficulty that interferes with normal, daily activity. Trouble sleeping – your breathing difficulty is accompanied by snoring, disrupted sleep, restlessness, or sleep apnea. Unable to get enough air through your nose during exercise or exertion – you feel “starved” or deprived of oxygen while exerting yourself or exercising.